While I can't say Garlic and Sapphires was "a real page-turner", I did enjoy it. 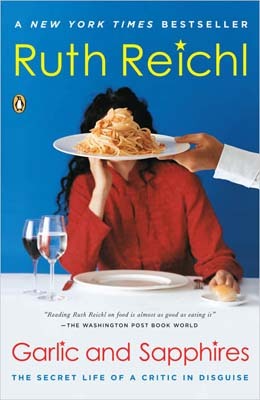 Ruth Reichl shares with the reader her experiences as a food critic for the New York Times. She writes in an autobiographical style about the various (mostly upscale) restaurants she dined in, food she ate, people she encountered and what it was like to be a restaurant critic. To me the one of the most intriguing parts of the book was the study of social prejudice among the upper class. Because she did not want to be recognized when she went into a restaurant, she took on elaborate disguises, even changing her personality to fit the character she was portraying. The reactions she received varied drastically depending on what character she became for each visit. It was astonishing how much her appearance affected the way she was treated by restaurant staff as well as other customers. Her writing style was very enjoyable, however, I will admit I had to look up several words. Reichl has quite an extensive vocabulary. I appreciate a writer who makes me grow beyond the boundaries of my everyday language. I got the feeling she wrote every word with thoughtful consideration. As I read about her experiences in these very upscale establishments, I couldn't help think about all the people in NYC who were going hungry while she was getting paid to enjoy foods such as foie gras and caviar every day, and how it would be great if she could find a way to use her writing ability to do something a little less pretentious. And then towards the end of the book she starts to redeem herself as the personalities she adopts for her characters begin to reveal to her what she is starting to become. This evokes a career change for her and, in my opinion, a happy ending. Perhaps I was taken in by the book because of my own love for cooking. Reichl describes with perfect detail the satisfaction that cooking and food can provide. The smells, the colors, the textures, the flavors, the sounds - my kitchen is more therapeutic to me than a day at the spa. She describes the cooking experience in such a profound way that every foodie can appreciate. I would love to have the gift of expressing my thoughts as beautifully as she does. I would recommend this book for that aspect alone, and the story itself is just a fringe benefit.